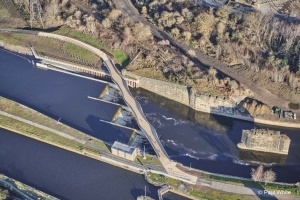 As part of the FAS improvements a replacement weir would be constructed on the Knostrop site, and the client wanted to explore the possible synergy between the new weir and the construction of a bridge across the river. 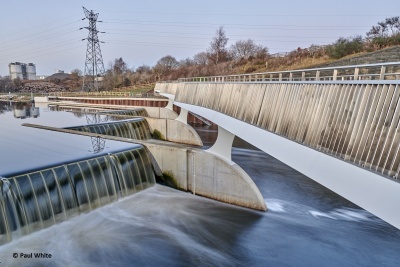 The final design uses the new weir walls as pier foundations for the bridge above, providing significant savings in budget, time and resources. Leeds City Council recognised the wider value for the design to be of high-quality and identifiable with its place. Despite the apparent complexity of the final design’s appearance, it only requires a single curvature in the fabrication of the steel plate elements. 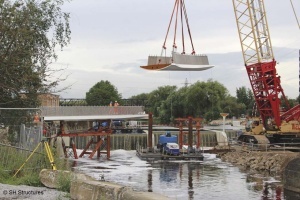 This served to simplify fabrication and enabled the bridge to be delivered within budget and programme. In views along the river the appearance is simple and sympathetic to the natural context. A curved soffit combines with the changing deck width to translate the varying plan width into a rippling deck edge detail, producing a dynamic 'sinuous' quality to mirror the noise and movement of the falling water beneath. Another unique feature of the design is that in elevation the piers are only 50mm thick and almost invisible in long views, creating the illusion of a floating deck. When viewed on closer approach the appearance of the piers changes, emerging as dramatic projecting cantilevers springing from the weir below. Lookout points have been positioned above each pier enabling people on the bridge to stop and enjoy views over the weir and along the river. Given the accuracy required to successfully realise the complex steelwork geometry and installation, it was decided to embrace Building Information Modelling (BIM) from the outset. The Revit model of the bridge enabled every element to be accurately represented and positioned; including every steel plate in the bridge’s curving geometry and all connection elements. This was particularly valuable when designing the highly complex bolted integral pier connection. During fabrication the BIM model was also utilised to allow every component to be spatially positioned and checked. The model was also used to assist in the design of the workshop temporary works as the complete length was fully assembled, allowing the critical interfaces to be set, checked and maintained during the fabrication process. One of the key features of this elegant structure is the slim piers. To achieve the required aesthetic and structural performance this area required careful consideration. Once the concrete weir walls had been poured and the holding down bolts installed, a detailed as-built survey was carried out. The recess bolt holes in the curved pier base plates were drilled and machined to match the as-built layout of each bolt group. With this work done, each base plate was trial-fitted to check for fit before the piers were finally installed, surveyed and cast in place. This attention to detail is critical to the successful installation of this type of precision detailing.